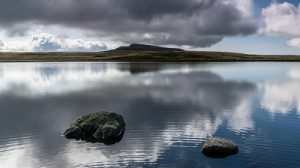 At 736 metres, Whernside is the highest mountain in the Yorkshire Dales National Park and lies on the route of the county’s famous Three Peaks Challenge. Dentdale makes an ideal starting point for one of the most enjoyable ascents of this giant, via an ancient packhorse route – the Craven Way. The late, celebrated fellwalker Alfred Wainwright described this as ‘the best of all routes up Whernside because of the lovely countryside from which it springs.’ It avoids the crowds who toil up from Ribblehead, with the added advantage of a scenic descent through the charming side valley of Deepdale. Whilst Whernside’s mighty flanks dominate upper Dentdale and give rise to its main river, the Dee, it is not the only high peak to excite fell-lovers here. Just 50 metres lower, neighbouring Great Coum appears even more magnificent in profile from the valley bottom. This is another great hill climb with a ridge offering the chance to bag other lofty summits in the vicinity, including nearby Crag Hill (682m) Green Hill (628m) and Gragareth (627m). At the head of the dale sits Great Knoutberry Hill – more a mountain really, weighing-in at a respectable 672m. Relatively easy access can be gained above Dent Station via another old packhorse route the Galloway Gate, now part of the Pennine Bridleway. All these summits lie within Access Land created by the Countryside and Rights of Way Act 2000 (CRoW), which gives ramblers the right to roam on areas of upland and uncultivated terrain in England and Wales (subject to local restrictions).